Austin Powers villain Dr. Evil is back. But he's not doing so good. Actor and comedian Mike Myers made an appearance on NBC's The Tonight Show to promote his role in the Margot Robbie thriller Terminal, in theaters May 11, where he brought back one of his most beloved characters. During Jimmy Fallon's monologue, the host was commenting on the numerous members of President Donald Trump's cabinet who were fired recently, when he revealed that Mike Myers' Dr. Evil was recently let go by the Trump Administration. Dr. Evil revealed that he was initially set to be the Secretary of Evil, but Steve Bannon already had that position, a reference to the President's former strategist. Dr. Evil, sporting his iconic grey outfit and the sizable scar across his face, said that he would ultimately just serve as an "ideas guy" in the President's cabinet, stating that the infamous border wall Trump has been proposing since announcing his candidacy, was really Dr. Evil's idea. However, he had initially wanted it to be a "moat with spiky blowfish." He goes on to add that he didn't want the Mexicans to pay for this wall, which was another point Trump had insisted on during the campaign and has since walked back, but instead, he wanted Alec Baldwin to pay for it, the actor who won an Emmy for impersonating Trump on Myers' former stomping grounds, Saturday Night Live, last year. Given how many have railed against Trump and his "evil" plans, it's certainly fitting that the hilarious Dr. Evil would take credit for the border wall, and even the much-maligned "space force," but, when asked if deporting the DACA "dreamers" was his idea, Dr. Evil said no, and that even he had his limits, stating that he's "evil but not a monster." When asked if he made any "friends on the job," Dr. Evil responded that he "got along swimmingly" with Ben Carson, a former Presidential candidate who now serves as the Secretary of Housing and Urban Development (HUD) under Trump. Dr. Evil added that they both got along because they were both, "evil doctors who didn't know why they were there." Dr. Evil went on to describe Donald Trump Jr. as "creepy AF," adding that he looks like he's missing a facial feature, except you don't know which one. He also went on to diss Jared Kushner before plugging his upcoming book, a parody of the controversial "Fire and Fury" book entitled "Fire and Fury and Also Evil and More Fire And Also Magma Too", before announcing that he will be running for President with his new running mate, the only man in America more hated that Donald Trump, Facebook founder Mark Zuckerberg. Dr. 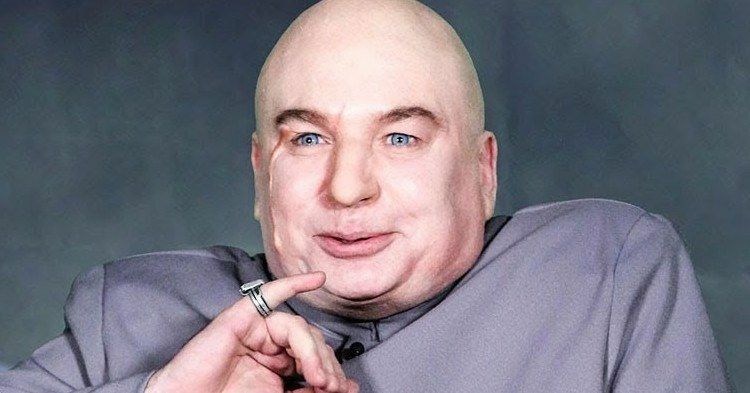 Evil first debuted in the hit 1997 comedy Austin Powers: International Man of Mystery, returning in the 1999 sequel Austin Powers: The Spy Who Shagged Me and 2002's Austin Powers in Goldmember. Mike Myers most recently portrayed a new character, British host "Tommy Maitland" on ABC's revival of The Gong Show, and he will also star in the upcoming Bohemian Rhapsody, a biopic of Queen frontman Freddie Mercury, arriving in theaters this November. There have long been rumors of a fourth Austin Powers movie although they have never come to fruition. Take a look at the full sketch below with Mike Myers as Dr. Evil, courtesy of The Tonight Show YouTube, along with the full interview with Mike Myers below as well.